Can’t think of anything much better to do on a cold, crappy, December Friday night than going to a hockey game. When I lived in Peoria, I went to quite a few Peoria Rivermen games. I didn’t grow up with hockey. I’ve never played hockey, but for some reason, I’m a fan of minor league hockey. Really, I’m a fan of minor league sports in general. I love minor league baseball and worked for next to nothing last summer for the Lansing Lugnuts just so I could have an excuse to be at the games everyday. It’s been a few years since I’ve actually been to a hockey game. Before J and I left Illinois, we went to both a Rivermen game and a Bloomington (IL) Prairie Thunder game. 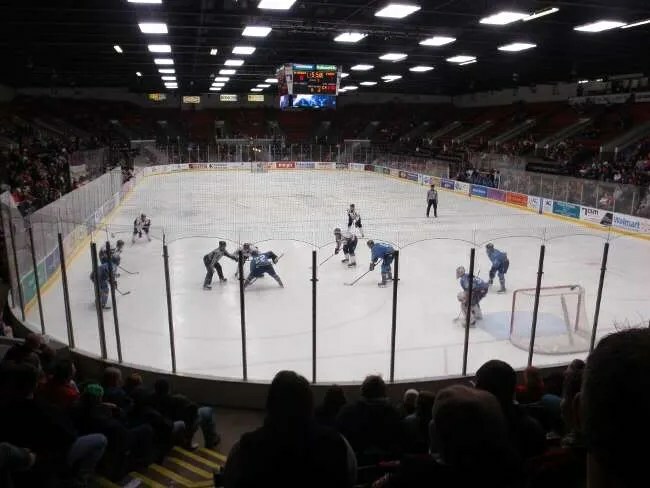 The ironic thing is the game we went to in Bloomington saw the Prairie Thunder host the Kalamazoo Wings. J got vouchers at work for tickets to a game this season. She had to work later than normal last night, but still wanted to try and go to the game against the Toledo Walleyes. I suggested just waiting a day and going to the Saturday game, but Steel Magnolia was performing during the intermission and she wanted to see them. Didn’t matter to me. I spent most of the day relaxing on the couch, so it was nice to get out for the evening. Wings Stadium is part of a larger complex that includes The Cube and The Annex on Vanrick Drive near I-94 on Kalamazoo’s southeast side. When traveling from Lansing to Chicago, we always drove by and said we should come to a game someday. Now, we live just a few miles from the stadium and can go to games whenever we want. 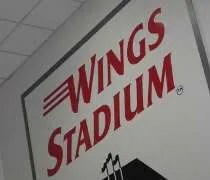 We came up to Wings Stadium from the south. As I was waiting to take a left on to Vanrick Drive, I noticed cars behind me turning into a parking lot. I had no idea where we needed to park or even if we were going to have to pay for it. After I made the turn, I drove up to the lot entrance everyone else was going in. There were a couple parking attendants pointing people in the right direction. There was also a sign. General parking to the left. Season parking to the right. There was no charge to park which is a huge bonus. I’m not sure I’ve ever been to a game where someone wasn’t charging you to park. Then again, Wings Stadium is sort of unique that it’s not in a business district. It’s kind of out there all by itself. After parking, we made the cold, icy walk to the ticket office. We had vouchers that we needed to turn in for tickets. The ticket office is inside the entrance that faces Vanrick Drive. It’s gates 1 and 10 if you’re looking for numbers. So, we got our tickets and headed inside. Right away, it’s pretty simple to tell Wings Stadium wasn’t built recently. The concourse areas are small and narrow. They’re a far cry from the style of newer arenas that have large, open areas. There’s really nothing fancy about the space. It was built to serve Southwest Michigan as an arena and convention space and that’s what it does. It was built in the mid-70’s as a 5,000 seat multi-purpose arena and you can tell that it’s almost 40 years old. Our first order of business was food. J had just gotten off work, so we didn’t have time for dinner. It was Frugal Fan Friday, but I don’t like hot dogs at all and J’s not a huge fan. We found the Exit 80 Diner and got in line. 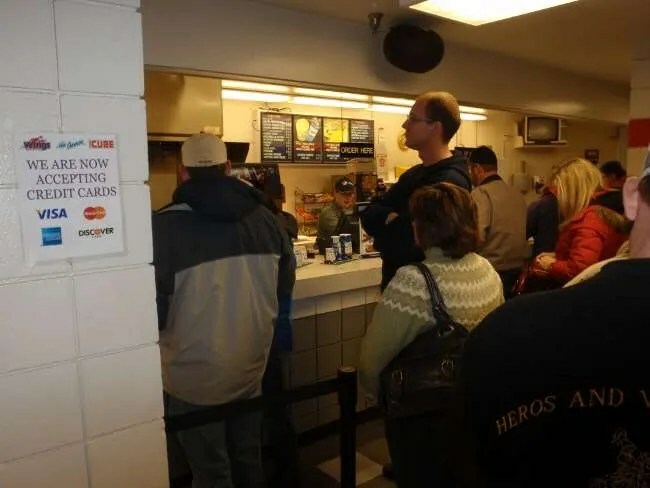 There are two cash registers at this stand and since it was almost game time, people were queuing up to get a snack for the first period. The stand was really understaffed. There were five people working, but they weren’t working really well. The line was split into two lines. One side had four staffers. The other side had one guy doing everything himself. He would take an order, fill the drinks himself, and get the food himself. Because he had to do it all, the line moved very slowly. Instead of filling a drink while he was getting change, he would have to stop what he was doing to fill then drink then move on to the next person. Like I mentioned, Frugal Fan Friday which means $1 hot dogs and $1 beers. We took advantage of the $1 beers. I got a Budweiser. J got a Bud Light. 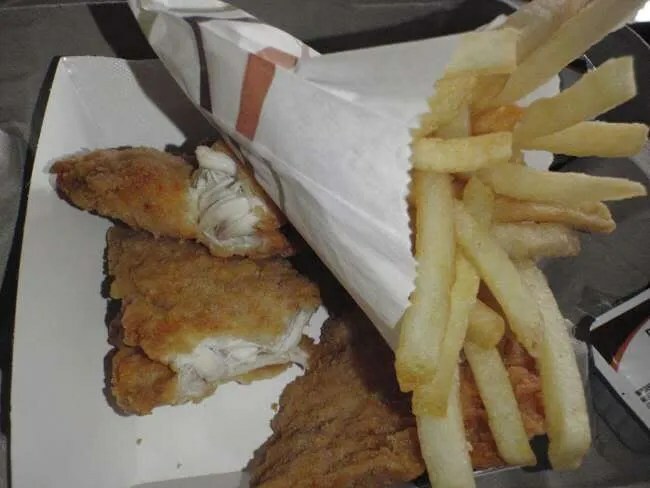 For dinner, we both got the chicken fingers and fries. The total cost was just under fifteen bucks. After running J’s credit card, the cashier went to get our beers. 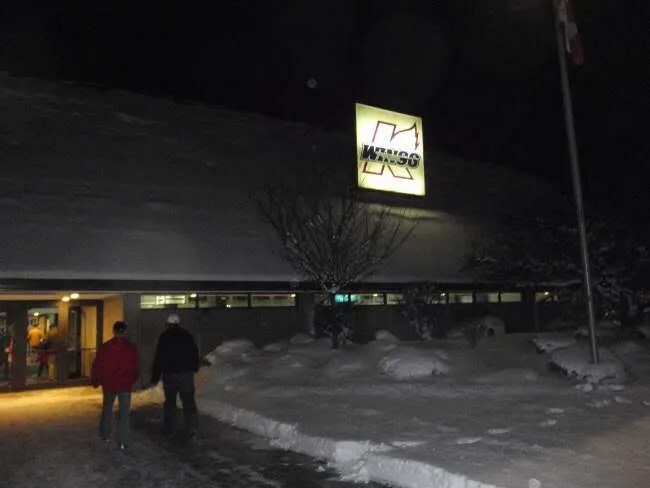 As he was walking back, he finally yelled at one of the other workers and asked who was working the deep fryer. A lady finally responded and got our chicken tenders from underneath the warming lamps while the cashier got ranch and BBQ sauce for us. By now, it was game time, so we made our way to our seats. J said the arena seemed small, but it didn’t to me. The layout makes it look smaller than it is. The official capacity for a hockey game is 5,113. That seems like a pretty good number, but they do it with pretty small seats and really cram you in. I’m not a huge guy. I’m not skinny either, but I usually fit comfortably in stadium seats. The seats at Wings Stadium were tight. It felt like I was sitting on top of J and she mentioned that it really felt like the guy sitting next to her, who wasn’t a big guy either, was sitting on top of her too. Our seats were great though and I can’t imagine there’s a bad view from anywhere in the house. We were in the “white” price range which is a small section on either end zone between the expensive seats and the cheap seats. We were about ten rows up just to the right of the goalie. Once we got settled, we both tore right into the chicken fingers. They were pretty standard GFS grade frozen chicken fingers, but the portion size was decent enough for the price….and how can you complain about washing it down with a dollar beer. The hockey is what I remember. I used to watch a lot of ECHL hockey. Lots of guys tripping over their own skates and lots of missed opportunities. That’s ok. I’m not there to watch an NHL level game. The atmosphere and the players are what I love about minor league hockey. They do what they can with atmosphere. There’s no video board, which as a video guy is disappointing, to get the fan interaction, but their PA announcer keeps the fans in the game. They also have Slappy….a giant, green fowl of some sort (duck, maybe), who worked the crowd and got the kids involved. Even though it doesn’t have all the modern amenities, Wings Stadium is a pretty good place to take in a hockey game. You’re close to the action which is something you’re not going to get in a larger market and best of all, parking is free. That’s something that is rare in professional sports these days and just one of the great things that will keep me coming to games.